On our 11 day Malawi and Zambia tours we focus on the highlights of these less explored East African countries. This overland tour actually departs from from Dar es Salaam in Tanzania and you still get to see a quite a bit of this beautiful country. 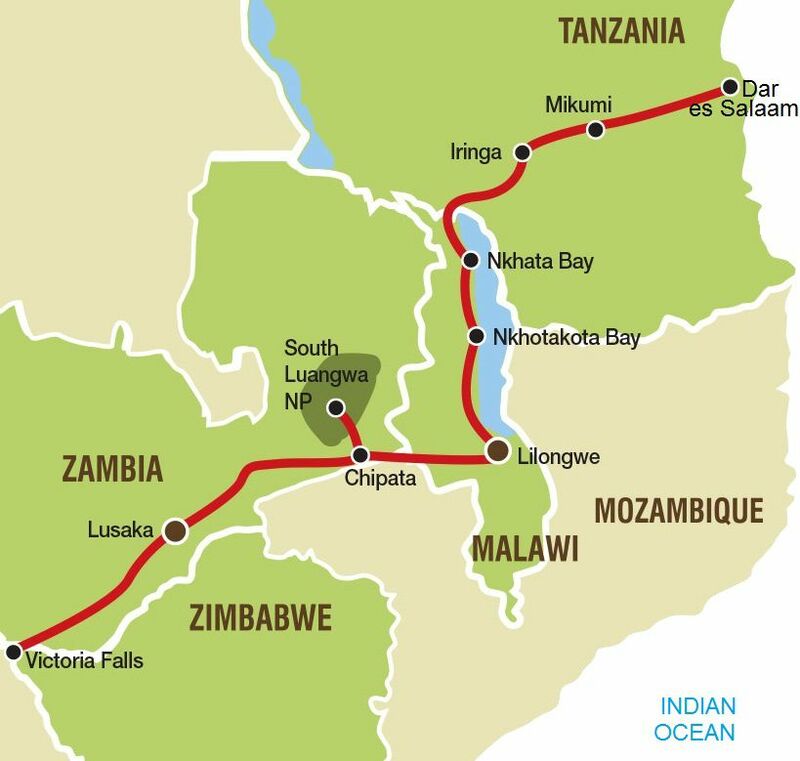 Highlights along the route will include Lake Malawi and South Luangwa National Park. This park is known for its high concentration of leopards and hippos. We end the tour with another big highlight – Victoria Falls in Zimbabwe – one of the 7 natural wonders of the world. This tour forms part of the 21 day "East African Adventure South"
Our Malawi and Zambia group tours depart from Dar es Salaam on day one. We highly recommend that you arrive at least one day earlier to give you some time to acclimatize. The overland group tour starts as we leave the coast behind us and travel inland and make our way to Mikumi. Mikumi National Park ranks as the fourth largest park in Tanzania and forms part of a 75 000 square kilometre wilderness that centres on Selous, Africa’s largest game reserve. Crossing the Southern reaches of Zambia we make our way to the adventure town of Victoria Falls, this afternoon we get our first look at the mighty Victoria Falls. Crossing the bridge between Zambia and Zimbabwe we get a view of “Musi oa Tunya”, the Smoke that Thunders as the falls are known in the local language. Victoria Falls offers a host of optional activities and these can be booked on arrival in Victoria Falls. Your tour comes to an end upon arrival in the town of Victoria Falls.